University of Iowa marketing students are helping three counties in north central Iowa brand the outdoor recreational activities in their area. Among the attractions is the High Trestle Bridge, shown here. Contributed photo. The Boone Forks region of north central Iowa is thick with recreational and outdoor activities. More than 200 miles of hiking trails, rivers for canoeing and kayaking, 50 county parks, six state parks and recreation areas, and the iconic High Trestle Bridge. The Marketing Institute is a three-semester program that gives top junior and senior marketing majors in the Tippie College of Business experience helping organizations solve real-world marketing and branding challenges. The program also includes a specially designed skill-building classroom curriculum and a summer internship that helps 15 to 20 students get a head start on their careers. Peggy Stover, associate professor of practice in the Tippie College of Business and director of the Marketing Institute, says the institute’s immersion field program gives students experience working with businesses ranging from start-ups to Fortune 500 organizations. Clients have included Fox Sports, Green Golf Partners, AllScripts, Toyota of Iowa City, Dane’s Dairy, and The Tile Shop. Stover also makes a point of lining up client engagements every year that will benefit a public entity in Iowa. Past public clients have included city governments in Maquoketa, Muscatine, Mason City, and Sioux City. Stover says Marketing Institute alumni have used their experience to begin marketing careers at employers such as Accenture, Principal Financial Group, Meredith Corp., SC Johnson, Hormel Foods, and AC Nielsen. But few people know the region exists—even some who live there. “People knew about the recreational activities in their own county, but few knew about the opportunities that existed just on the other side of the county border,” says Matt Cosgrove, director of the Webster County Conservation Board. To encourage more people to use the amenities, officials from Webster, Hamilton, and Boone counties banded together to create the Boone Forks recreation area concept and turned to a team of University of Iowa marketing students to help develop a brand for the region. The five students, tasked with increasing awareness of the region for the people who live there, are a part of the Marketing Institute in the Tippie College of Business. The heart of the concept is the Boone Forks Wildlife Management Area, where the Boone and Des Moines Rivers meet about 25 miles south of Fort Dodge. The 4,600-acre, heavily timbered preserve features hiking, canoeing, camping, and hunting and fishing. Not far away, other parks offer cabin rentals, horseback riding, golf, a convention center, and more hunting and fishing. The region also is home to the Skillet Creek Indian Mounds and the remains of a ghost town called Hard Scrabble. Cosgrove says the Boone Forks concept expands activities well beyond the junction of the Boone and Des Moines rivers. “We want to broaden its definition from being just a wildlife management area to being an activity area that’s part of a recreation corridor that encompass all of these natural assets up and down the rivers,” he says. That also includes not just public recreational facilities, but community festivals, hotels, restaurants, and other amenities too. A family enjoys an outing on Briggs Trail. Reese Vedder agrees the area is too little known. The Marketing Institute student and team member grew up not far away in Estherville, Iowa, and never realized how many amenities the Webster/Hamilton/Boone region offered until he started working on the project. The students are conducting several market studies to determine the number of residents in the region who participate in outdoor recreational activities, what kinds of activities they like to participate in, and their awareness of the opportunities available nearby. 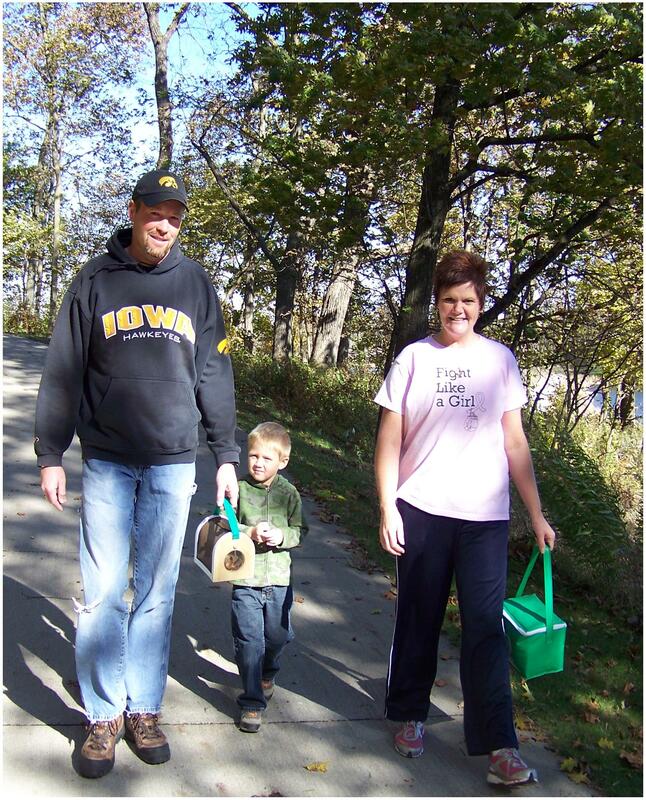 “We’ve found that residents are receptive to outdoor leisure activities that don’t take too much time, like walking or bird watching,” says Amber Leisinger, a team member from Sumner, Iowa. The market research also shows that convenience is important. “All of these activities are within an hour’s drive of each other, so they’re easy to get to for residents,” says Margaret Kaufman, a team member from Oakbrook, Illinois. “These county parks and state recreation areas are a great way to provide an alternative to people in Iowa for not having a national park,” says Michael Hoffman, the team leader from Des Moines. The students say one potential marketing angle—and not just for Boone Forks but for the state—could be the fact that Iowa is the only state in the country without a national park. The team will meet with the Boone Forks Regional Planning Committee in late April and provide a branding guide, along with proposed logos, sample itineraries, a brochure, website design, and social media plan. Kayakers go for a paddle on Little Wall Lake. The student team members plan to pursue careers in marketing and say being part of the Marketing Institute helps provide practical experience that they can use to build their resumes and land a job after college. “It’s great having real project management experience with an actual client, to talk with them and see what their reactions are to our work,” says Michele Siamis, a senior from Western Springs, Illinois. Cosgrove also hopes the students develop measures of success so they can know if the branding and marketing plans have worked. He says the students are professional and energetic and he’s enjoyed working with them. “The most valuable part of working with them is having another set of eyes looking at our plans from outside and asking smart questions that we haven’t thought about it,” he says.